Sen. Toni Atkins, D-San Diego, is poised to become the leader of the Legislature’s upper chamber next year after gaining support Thursday from the Democratic caucus. Atkins, who went from San Diego City Council to Assembly speaker to the Senate, will succeed Sen. Kevin De Leon, D-Los Angeles. De Leon, who grew up in Logan Heights, is giving up his leadership role to challenge Sen. Dianne Feinstein, D-California. De Leon said a formal vote will be taken early next month, with a transition taking place later in 2018. 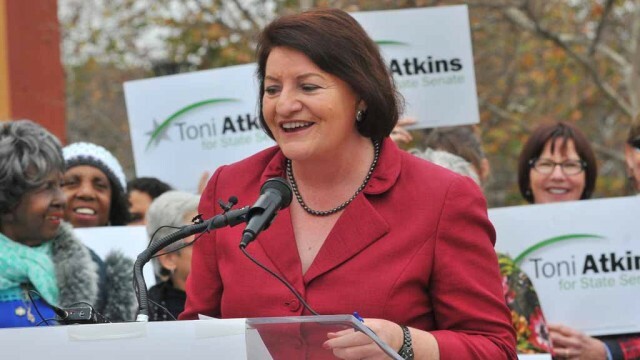 “I’m pleased to announce our caucus is unified in support for Sen. Toni G. Atkins of San Diego to serve as our next president pro tempore,” De Leon said. He said Atkins will be the first woman to lead the California Senate. “Toni is a leader of great experience, achievement and integrity, and I have every confidence that she will lead America’s most accomplished legislative chamber to even greater heights,” he said. “Today, I am humbled by the trust my colleagues have placed in me, and I intend to earn that trust every day by working tirelessly and inclusively to keep California a place of opportunity for everyone,” Atkins said. Atkins served on the City Council from 2000 to 2008, representing Hillcrest and North Park. She was elected to the Assembly in 2010 and became speaker in 2014. Voters sent her to the Senate for the first time last year.